Some evenings, the only cure for existential angst is to bring up YouTube and search for episodes of The Gong Show. Ever since getting back into this bizarre, amateur variety show, of which I have only fragmentary memories from childhood, I have theorized that Chuck Barris did indeed work for the CIA, but his assignment was not to assassinate foreign agents, as he asserts in his putative “autobiography,” Confessions of a Dangerous Mind (1984). Instead, in the manner of the abstract expressionists the Central Intelligence Agency bankrolled throughout the 1950s to combat Communism on the cultural front, Chuckie-Baby was handed the keys to his cut-rate performance art revue to bolster the American psyche during the post-Watergate, Carter-malaise years. In my dream alternate history, The Gong Show’s irreverent, anarchic, everyone’s-queer-including-thee-and-me party ethos has the unintended consequence of preventing Ronald Reagan’s ascension. But this piece isn’t about Barris or his show, really, nor is it about the crucial hinge years at the end of the 1970s. It’s about creepy circuses. 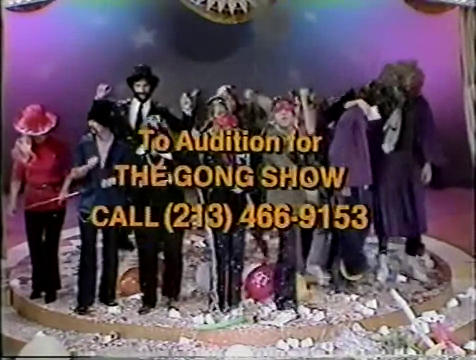 During the end credits of The Gong Show episode “You Can’t Say That” (1977), a phone number beckoning viewers to audition for the show appeared. My wife immediately said, “You should Google that number! See where it goes now!” After considering this for a moment, assuming it would produce a bunch of Gong Show fan pages, I decided to follow her suggestion. 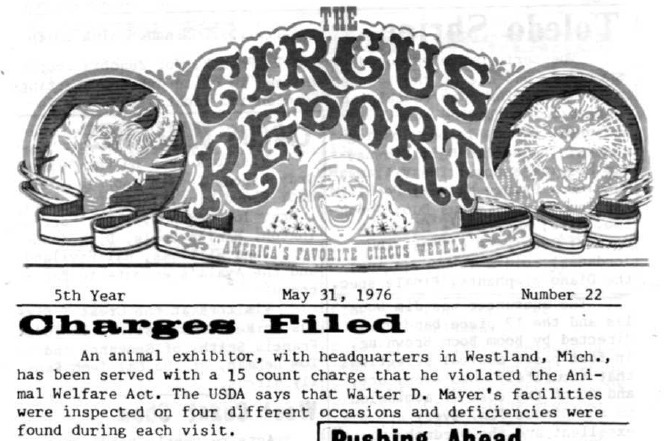 And in the first page of search results was a link to a PDF, intriguingly located at the Circus Historical Society, which turned out to be an issue of a circus industry periodical from 1976 titled The Circus Report. I thought to myself that the producers of The Gong Show must have placed an ad for novelty acts in a circus newsletter, and I was right. A tiny nine-line ad appears on page 13, asking for “all sorts of novelty acts for a [new] network show.” (Imagining Chuck Barris and his co-producers researching the best places to find talent for their new show and deciding on The Circus Report is a tantalizing exercise I will leave to the reader.) But the ad soon became the least interesting aspect of this remarkable document from 1976. Reading the issue from front to back, I fell into another world, a wonderland of secret circus history full of tales from the “Old, Weird America” that Bob Dylan chronicles, and a set of dark, tragic stories that would not go amiss on the HBO series Carnivàle (2003). The Circus Report, if this particular issue is indicative, was put together like an old-school zine: clip art, text laid out in a handful of different fonts, very clearly mocked up on a photocopier, and so forth. But these stories aren’t about the latest indie bands. They’re news articles about minor-league circuses in trouble for animal cruelty, reviews of circus performances full of circus-insider humor, want ads for elephants and elephant men alike, gossip columns, cryptic sets of numbers comprehensible only to the circus-initiated, and even circus obituaries. The first thing that hit me was the seeming callous indifference these circus folks had to animal cruelty. Now, granted, the front page headline is about a case of animal cruelty in Michigan. That sort of prominence on an industry publication is noteworthy. It’s been said by historians and sociologists that you can tell a lot about a culture by the laws it passes against something (and of course there’s the popular but sadly apocryphal Gandhi quote about how you can tell a lot about a culture by how it treats its animals). I’d argue that the sheer number of animal trainer-related advertisements and stories about animal acts is indicative of the industry’s anxiety around animal-based circus acts, spurred by an increased consciousness about animal rights that was starting to build up steam in the 1970s. Even today, American circuses are among the only ones in the world to allow big animal acts, and it was only in 2015 that elephants were phased out by Ringling Bros. and Barnum & Bailey. The amount of inside baseball in The Circus Report is tremendous. Writers for the periodical look at both entire circuses and one-off shows, and the “gossip column” on page 5 by Billy Barton, (himself a circus performer who worked a trapeze act and brought a frisson of British music hall camp to the American circus world) consists of a bunch of shout-outs to performers and their favorite animals. As with a lot of pieces in The Circus Report, there’s always a slight tendency towards tragedy, even among the gossip items. In Barton’s column, there’s an item about a freezer car burning down—twice in eight days. Apart from The Gong Show ad that brought us here, there are lots of ads for animal acts, both seeking and selling. Photographers, printers, circus equipment sellers; all the invisible infrastructure necessary to keep a circus road show going. I especially liked the ad on page 14 where a Québec-based circus seeks a new big top tent and gives their travel itinerary over the next few months so the tent-maker could hook up with them mid-tour. 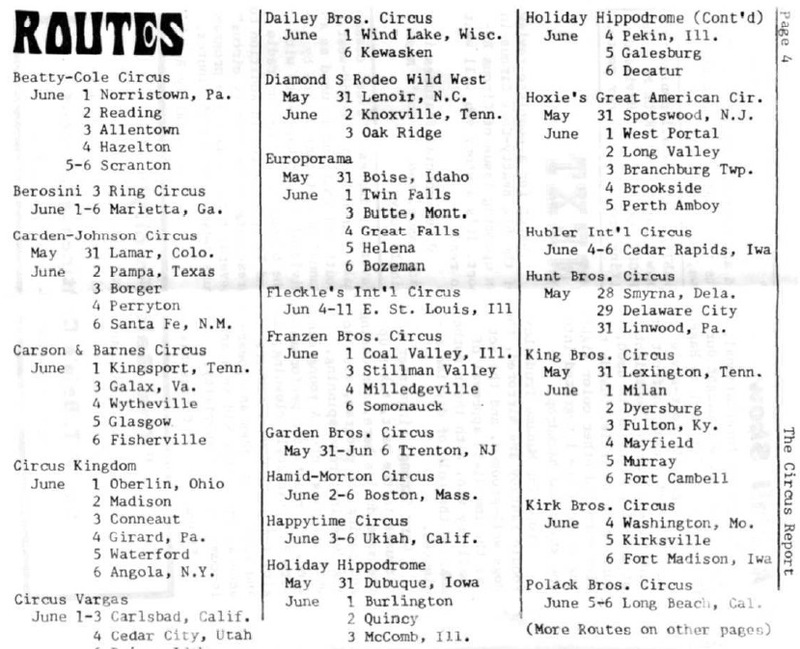 Speaking of which, the most fascinating piece of circus ephemera here, to me, are the travel schedules on pages 4, 10, and 14. 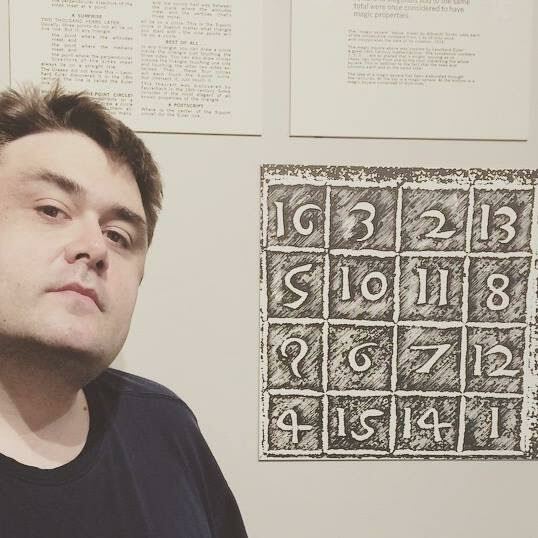 On the surface they’re simply a listing of the dozens of tiny outfits that were working the U.S. at the time, along with the dates they’d be in town, but they take on a numbers station-like crypticness after you read enough of them. And that’s the other thing about this issue of The Circus Report: it shows exactly how many smaller mom-and-pop operations were in play in 1976. As noted earlier, the circus scene in the U.S. since the 1980s has been dominated by the near-monopoly of Ringling Bros. and Barnum & Bailey, which took their act into big arenas in big cities for long engagements, bypassing the smaller towns seen in The Circus Report routes. The circus industry is thus yet another indicator of the greater trend towards consolidation and deregulation in the entertainment industry in the Reagan ’80s, from television to professional wrestling. And now, to probably the darkest part of an already fairly bleak and weird document. The obituary section of this week’s Circus Report contains only two entries. The first is on Frank Kauffman, inventor of an early unicycle and trick cyclist who passed away at 92 years of age. And the other, right below it, like something out of a tragic old ballad: a young child of three crushed under a circus wagon wheel. 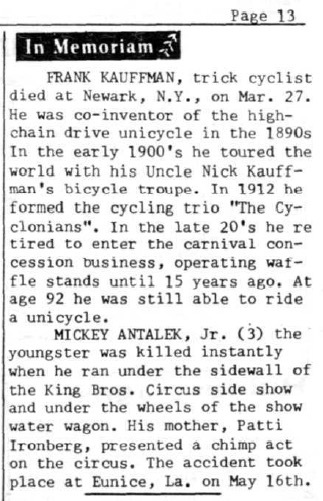 The obit coldly spends column inches informing the reader that young Mickey’s mother “presented a chimp act on the circus.” Circus life: a hard, cruel, difficult line of work, even in the sunny, bicentennial 1970s. Wow, what a crazy, random discovery. It’s always fun to dig up old addresses and/or contact info from decades past and see where they lead to nowadays. But then at the same time, the results can be bittersweet. For example, I have a buddy that’s a huge KISS fan. He dug up an old clipping of a KISS Fan Club mail order membership form which he’d filled out back in 1976 yet never sent away for the cool swag. I took a look and realized that the Fan Club address was somewhere in the San Fernando Valley, not too far from where I worked. Just for kicks, we Google mapped it and found a bleak-looking, nondescript industrial business park with uninviting, dull suites..one of which was, at one time, a hub for KISS fans worldwide. I imagined women with feathered ’70s hair and tube socks stocking shelves with KISS shirts and stickers and shipping out orders as they came in. I pictured a rotary phone on a small office desk. Just the thought that, at one time, people actually worked for a KISS fan club, of all things, really had my brain perculating. Yet now, the Google street view of the same location decades later kinda killed it. Nevertheless, your trek really did lead to something even darker and creepier than the Gong Show was. That’s nuts. My dad used to watch the Gong Show religiously from ’76-’80 (I believe the full extent of the show). He loved Chuck’s crazy antics and the random assortment of talent and weirdness that made the stage. Often, he encouraged me to join him for this quality father-son time. It was hard for me as a 6-10 yr. old kid to put down my Star Wars toys to join him on our itchy ’70s couch, but I did so enough to remember how wild that show was and the all-out chaos that sometimes ensued. Actually, your article beckoned me to go back to YouTube and start watching Gong Show episodes all over again, and it’s been a comforting feeling, remembering a carefree ’70s childhood and the laughter that filled my days. What a good time it was. You know ABC is trying to bring the Gong Show back? I’m curious as to how they’ll pull it off, but I’m more apt to think that certain things can only exist at certain times, and the Gong Show is really one of those things. What do you think? Yeah, once I had finished writing that intro, I found myself almost wanting to write about The Gong Show instead; I still may at some point. In watching those YouTube episodes, I found there was something profoundly _leveling_ about the anarchy inherent in the show. Even if Chuckie-baby was the ostensible ringmaster and a lot of the most outrageous acts were actually non-amateurs, the chaos was so well-choreographed, so authentic-feeling, so much FUN. The celebrity judges, the band, the host, the performers (both amateur and “amateur”), the studio audience, even the stage crew (RIP Gene Gene the Dancing Machine), they all felt… equal in a way, all pulling towards the same goal of entertaining. I think a lot of people look back at The Gong Show’s vibe as too late-’70s decadent, too coke-addled, but I’d argue it’s a near-Brechtian subversion of the stuff that was on television at the time and/or the variety show tradition. I tend to agree about a Gong Show revival. I don’t think a network show fits that role in 2016; honestly, with the hall of mirrors that is YouTube stardom and other online venues for amateur stardom these days, a new Gong Show seems utterly redundant.